New Year’s Resolutions Fail – Goals Succeed. Read on for tips on how to succeed this year with your health and fitness goals. Successfully executing any personal strategic plan for change requires that as you develop your plan, you effectively incorporate these seven steps for attaining each and every goal. 1. 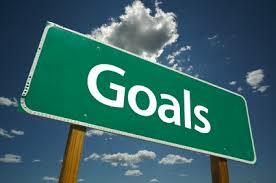 Express your goal in terms of specific events or behaviors. For a dream to become a goal, it has to be specifically defined in terms of operations, meaning what will be done. When a goal is broken down into steps, it can be managed and pursued much more directly. “Being happy,” for example, is neither an event nor a behavior. When you set out to identify a goal, define what you want in clear and specific terms. 2. Express your goal in terms that can be measured. How else will you be able to determine your level of progress, or even know when you have successfully arrived at where you wanted to be? For instance, how much weight will you lose? What event will you enter for fitness? 3. Assign a timeline to your goal. Once you have determined precisely what it is you want, you must decide on a timeframe for having it. For example, I will lose 5 lbs in 8 weeks!! 4. Choose a goal you can control and that is realistic. Unlike dreams, which allow you to fantasize about events over which you have no control, goals have to do with aspects of your existence that you control and can therefore manipulate. Goals must be realistic! If you have a busy job, family, life, then you will need to take these things into consideration. Hire a professional to help you set a realistic goal. Trainers can help with fitness, nutrition, and wellness. 5. Plan and program a strategy that will get you to your goal. Pursuing a goal seriously requires that you realistically assess the obstacles and resources involved, and that you create a strategy for navigating that reality. Willpower is unreliable, fickle fuel because it is based on your emotions. Your environment, your schedule and your accountability must be programmed in such a way that all three support you — long after an emotional high is gone. Life is full of temptations and opportunities to fail. Those temptations and opportunities compete with your more constructive and task-oriented behavior. Without programming, you will find it much harder to stay the course. 6. Define your goal in terms of steps. Major life changes don’t just happen; they happen one step at a time. Steady progress, through well-chosen, realistic, interval steps, produces results in the end. Know what those steps are before you set out. Step one for fitness goals… get to the gym, start today! 7. Create accountability for your progress toward your goal. Without accountability, people are apt to con themselves. If you know precisely what you want, when you want it by — and there are real consequences for not doing the assigned work — you are much more likely to continue in your pursuit of your goal. Find someone in your circle of family or friends to whom you can be accountable. Make periodic reports on your progress.